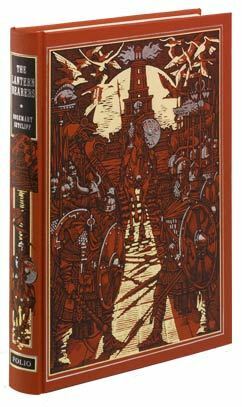 Winner of the Carnegie Medal, The Lantern Bearers is in many ways the most thoughtful of Rosemary Sutcliff’s Eagle of the Ninth Chronicles. In Penelope Lively’s specially commissioned introduction, she comments, ‘it is a work of her maturity, one in which she had already honed all her signature skills – her power of narrative, of pace, her way with characters, the rich evocations of a Britain that is gone but that she had recreated. It is full of the creamy surf of meadowsweet alongside crimson cloaks flying in the wind.’ It is also the book in which a truly British mythology begins to take shape. In the figures of Ambrosius and Artos, the two leaders fighting to hold back the Barbarian tide, Sutcliff has utilised a germ of the Arthur-legend. Penelope Lively comments, ‘this smoke-signal from a legend of the Dark Ages is one of the inspired touches that lends an extra veracity’. This edition is illustrated with beautifully composed, richly symbolic drawings from the award-winning Russian artist, Roman Pisarev, that capture the excitement of Sutcliff’s tale, from the heat of battle to the last transports slipping out of the harbour of Rutupiae.